Dr. Carl June: "Putting the Immune System on Steroids"
A professor of immunology at the University of Pennsylvania’s Perelman School of Medicine, Dr. Carl June gave a captivating description of the promise of immunology therapy during a presentation Wednesday, May 14 at UC San Diego. 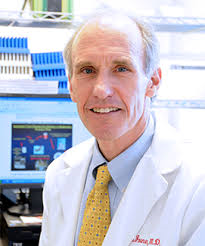 For Dr. Carl June, lead researcher of a promising anti-cancer therapy known as immunology, the future looks brighter for those afflicted with cancer, based on early results from his clinical trials on a relatively small handful of patients. A professor of immunology at the University of Pennsylvania’s Perelman School of Medicine, June gave a captivating description of the treatment during his presentation Wednesday, May 14 at UC San Diego. In a simplified way, here’s how the process works: A cancer patient donates white blood cells known as “T cells,” which are first genetically altered with a modified HIV-infused virus, then injected back into the patient. The result: the cells of the former HIV virus, whose unhealthy genes have been fully neutralized, attack and “kill” the patient’s cancer cells. So far, the innovative, highly complex treatment has been applied to a small sample of 30 select patients, 27 of whom have seen their cancers go into temporary remission. Current trials have been limited to patients with lymphoblastic leukemia. Late last year, Science magazine hailed immunotherapy as the “Breakthrough of the Year” in all of global science, with June’s ongoing work leading the way. Immunotherapy is generally defined as the treatment of disease by inducing, enhancing, or suppressing an immune response. “I’m just a regular guy who’s been in the right place at the right time,” the soft-spoken June told the audience of nearly 500 that virtually filled the La Jolla Playhouse’s Mandell Weiss Theatre. The next hurdle is making the treatment scalable to a wider group of patients, with the intent of treating other forms of cancers on a mass-produced scale. With so much at stake, large pharmaceutical firms are currently embroiled in multibillion-dollar lawsuits regarding immunology treatments – including June’s projects – as they relate to cancer-fighting remedies. Initial funding of $20 million, which is declining along with a downturn in federal funding, has come from the Leukemia and Lymphoma Society’s national unit. June’s presentation was the latest in the Helen Edison Lecture Series co-presented by UC San Diego Extension and the Center for Ethic in Science and Technology. The series is based on “The Emperor of All Maladies,” the 2010 Pulitzer Prize-winning book by author/cancer researcher Siddhartha Mukherjee. The next presentation will be Wednesday, June 4 featuring Rebecca Dresser, a professor of ethics in medicine at Washington University in St. Louis. An expert in biomedical ethics, she will address her personal experience in dealing with her own bout with cancer, based on her book, “Malignant,” in which she and other ethicists tell their personal stories.